It has been 12 years since you released your first timba CD Vitaly y su timba Habanera “Desnudar tu cuerpo”. We know you are busy with many other projects, but what finally brought you back to timba? What? 12 years? No, no it can't be! It seems like only yesterday. (ha ha ha) Certainly it has been 12 years. Could I remind myself to record an album, now at least every two years?!?! But seriously, Timba (you can call this style of music as you see fit), in the end this is my “hobby”! Usually people ask me – “what is Timba”? I think this question is simply impossible to answer. And I find it hard to give a short answer. Timba - is an important moment of this musical evolution, combined with the traditional richness of the Caribbean with deep African roots. For me personally Timba is a lifestyle, where everything is allowed (of course, always within limits!) That’s why this style worries me and torments my soul. (Ha, ha, ha) On the other hand, every musician wants to leave a little of each, I really love this music, and I always have a great respect for it, probably if I am returning to it, is that enough? Where and when did you record, mix and master “Para ti”? 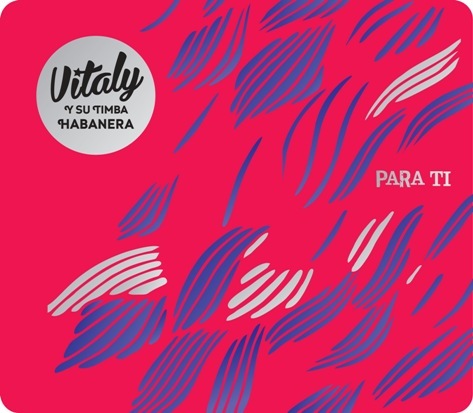 The new album of Vitaly y su Timba Habanera was recorded in studios in Miami, Havana and Ljubljana (Called Vitali’s “Bermuda triangle”) (ha ha ha) The album was recorded by the sound engineers Waldy Dominguez, José Raúl Varona and the recording assistant Pablo Collazo Rivas in Havana. The album was mixed by sound engineer Paul Wickliffe in Skyline Productions studios in Warren, NJ, USA. Sound engineer Stuart Hawkes took over the in the studio Metropolis Group in London, UK. Like the album “Desnudar tu Cuerpo”, this album “Para Ti” was produced by Pelikan Records. I would like to take this opportunity to thank all of the people who helped me and did everything possible for this album to see the light of day, believe me it wasn’t easy. Was the working process the same, where you wrote the arrangements and then the musicians involved in the project wrote the lyrics? Yes, that’s how it was. I wrote the lyrics and arrangements of the whole album. It's no secret that the Cuban groups when they rehearse, literally change the material with each rehearsal, so arrangements develop and change together with the process resulting in the final product, which the listener can hear on the finished CD. This method is very good, in the process new ideas and interesting touches are born. Unfortunately, I don’t have that opportunity. (Ha ha ha) While the project Vitaly y Su Timba Habanera was in the studio, I had to choose a completely different approach, where I didn’t tell anyone, and that is interesting from the point of view of the author. 15 years ago an arranger told me “Vitaly it will be very hard to please you with the arrangements, because there will always be someone who interferes with something, and you know why? Because (unlike the rest) only you know exactly how this should sound! So, write it yourself and don’t waste your valuable time! Please!''. As for the lyrics, yes, you're right. I did not write the lyrics and also at the first opportunity, I approached my friends (peers) who accepted my request with pleasure. Four songs were written by Giraldo Piloto (Para ti, Verano, Yo no puedo y Mi timba). Ariel Cubría wrote three songs (El pesimista, De ayer y En silencio). One song was written by Joaquín Betancourt (Las cosas) and singer Alberto Alberto Cuando se asome la tristeza). A total of 10 tracks: 9 vocal-instrumental and one instrumental called Apartamento 50. You meant to release “Para ti” last year. Was there any particular reason for the delay? I have to say that apart from the recording of this album there were constantly many difficulties in the way, it was as if ''someone'' did not want this album to be born. The birth of this album was very painful! One of the biggest obstacles to the release of my new album was the "careless and irresponsible attitude and abuse of my trust" by a colleague (now ex), although I express this view very carefully, it deserves an even more serious definition. Subsequently, this led to a financial "collapse" and he was removed from the project. I will not give specific names, although a large number of musicians know well to whom I refer. With this act, this person is punished himself, because in our time of the Internet, things like this are is simply impossible to hide! And it is this “careless and irresponsible” attitude delayed the release of the album (at least) for 2 years, and even more. But this is “food” for Hollywood. I don’t want to remember what happened, for me this is over. The most important thing was the goal I met, and the success of the album “Para Ti”! Did you collaborate with the same artists? It was almost impossible to bring all the musicians that I like to be on the album “Para Ti” in Havana. It was like something out of the series Mission Impossible! But that did not stop my plans from being fulfilled. All musicians that I was able to get together, are the best found in the genre. As with the first album, the album “Para Ti” singers Coco Freeman and Ricardo Amaray participated. The singer Leo Vera was also going to take part in the recording, but due to a national tour of Cuba, at the last moment, he was forced to withdraw from it. On the new album are very talented new faces, such as Maikel Ante Fajardo, Joaquim Moré, Jannier Rodríguez Millan and the wonderful singer Sory Pérez Corominas, who sang the beautiful ballad "En silencio.'' I believe that our collaboration with her is not finished. It wasn’t more than just one song. I’d love to write other things to for her. “Sory, remember our conversation?” I don’t throw my words to the wind! Can you give us a credits list for the album? The rhythm section was composed of and recorded by musicians in Miami. The bass was recorded by Edguar Gararriaga, Piano - Tony Pérez. Timbales were recorded by the excellent Reinier Guerra, who also recorded some numbers on the drum kit. The congas and bongo were immortalized by Daniel Barrios. In Ljubljana all the keyboards were also recorded, taken on by my friend, the talented pianist Sebastijan Duh (who also recorded the piano for the ballad "En silencio"). The horn section was recorded in the Slide Records studio en La Habana. The tenor sax was recorded by Luis Felipe Lamoglia and José Luis Hernández. Soprano sax was recorded by the legendary Germán Velazco. The baritone sax was recorded by a Young and promising musician Yuniet Lombida Prieto and my old friend and colleague, a member if many of my projects, the great virtuoso saxophonist Primož Fleischman. The coros by Enrique Pérez Prieto, Jannier Rodriguez Millan and Yordis Larrazabal Moya. The lead vocals for the album “Para Ti” were by the singers Ricardo Amaray, Joaquín Moré, Coco Freeman, Maikel Ante Fajardo, Jannier Rodriguez Millan and Sory Perez Corominas. “Desnudar tu cuerpo” really was not an easy CD to acquire. What are your international distribution plans this time? I would like to devote a little more attention to this subject. For me, like many others, I would like the new album "Para Ti" to be heard by more people, because, in the end, this album is created for them. It's no secret that one of the major diseases of our profession is piracy! It's like cancer (incidentally, it is one of the rare diseases that kills itself). I've always been an open person and call things by their name, unadorned, as is. I don’t want to be "misunderstood", I understand and I do not want to campaign for anyone, but for the moment, the only option for listening to the music of Vitaly y Su Timba Habanera is by purchasing the physical CD. It is vital for the project, as all proceeds from the sale of CDs automatically go towards the continuation of the project! The physical disk - is the only source of income for this project! Given the unfavorable situation that has developed in recent years, it is difficult (dare I say - it is not possible) to be based on additional sources of funding. Many musicians are facing similar difficulties and the fact remains: if there’s no money - there will be no projects! We make music for everyone, but if the only source of income for a studio project dries up, you can understand that it will have consequences! To date (in most cases) the main source of funding of the bands are the concerts, at which discs are sold in bulk. This is normal, and it should be. If a person likes the show and has good impression of that particular gig then buy a CD and you will have a memory that will last a lifetime. As I said, the only source of funding for my project is the distribution, is the physical disk. The record company Pelikan gave the right to distribute only to some DJs, whom I know well. One is DJ Salsani, who has the exclusive right to distribute the album in Denmark. Overall, I have to say that DJ Salsani has done much for the distribution of the first album "Desnudar Tu Cuerpo". Thank you very much for your hard work, Anni! Distributing the discs via DJs gave very good results and in principle, it achieves the sole objective - anyone can immediately buy the album as at concerts without losing the time it takes to find a disk online, in a store, etc. I pay tribute to many DJs in Europe, who immediately began to purchase the disc. Note - not copied, purchased! I am happy with the early reviews of the album, which are simply fantastic!. Right now I understand and realize how many people were waiting for the release of my new album, as fans of this genre, and fans of the project Vitaly y Su Timba Habanera. Everything I did - it was not in vain! Thanks guys, wholeheartedly for your support! How would you compare or contrast “Para ti” with “Desnudar tu cuerpo”? "Desnudar Tu Cuerpo" was not recorded as I would have liked. But keep in mind the fact that it was my first “salsa” project and I continue to stick with it. (Ha ha ha) But I want to point out that this does not mean I'm not satisfied with my first album, quite the contrary. I am very proud of my “firstborn”! Although, now I would have written it in a very different way. (Ha ha ha) Accumulated experience, changes your viewpoint, etc. Do you feel that the intervening years and all their experiences have affected your arrangements? I don't think so. However, who knows? I repeat once again, let others speak about this. I should note that in all these years, I hardly followed what was happening in the Timba genre, and since 2008, generally I try not to listen to this genre, for one simple reason: The less you listen to other artists before creating new material, the less it affects your “head”, i.e. it stays clearer! After all, the music we listen to remains deeply planted in our subconscious. I wanted to be true to myself. Maybe my music sounds a little different; it is not "cliché." But I think I succeeded. In any case, I'll take the criticism from colleagues, friends and other people who have purchased the album. In salsatechs from Italy, France, Sweden, Denmark, Norway and many other countries, people with extraordinary ease recognize the style “of the author of this project”. I'm glad. That means Vitaly y Su Timba Habanera is not lost in the immense flow of productions that are released daily. What changes have you seen in the timba scene in the past 12 years, Cuban and international, as well as the Latin scene in general? This is a very sensitive issue. As I said above – “Different strokes for different folks”. You know that in North and South America, Spain, etc. the Latin scene is part of the local folklore. So all is well! As for the other continents, such as Europe, you see a decline towards the Latino scene as a whole, but I think that good music always has and will find its audience, regardless of time, place or where you are, depending on the crisis. I am very happy with the fact that the “popularity” of Timba is gaining momentum. During the last period many dance schools, seminars, conferences and festivals have been established that take place in almost all countries of the “old continent” in Germany, Italy, France, Denmark, Poland, Norway, Russia, Croatia, Sweden, Switzerland, Spain, etc. While on the other hand, I’d say it’s too soon to talk about a mass scale infatuation with Timba. One of my goals was to create a quality album. There are a lot of so-called “fly by night” albums that undermine the “credibility” of the style. Of course, once again, everything is connected to a source of financing, as they often are young performers, who, by hook or by crook are trying to record their own music and present it to the public. All this is understandable. But sometimes it is a product that is simply impossible to listen to. And if you put something on to listen to from the genre “New Timba”, most opinions are “contaminated” and it is impossible to correct them or, at least, it is a very difficult and thankless task. You had some fantastic stories about events surrounding “Desnudar tu cuerpo”. Are there any fun behind-the-scenes stories you can tell us about the writing/recording of “Para ti”? Yes, during the recording of the album “Desnudar Tu Cuerpo” there were a lot of amazing stories. I should say there was nothing like that with the new album but that’s not how it was. It might only be interesting to fans of horror movies, here, perhaps, there could be more stories to tell first hand as they say! (Ha ha ha) But I think it is useless. But one thing, in my opinion, could be very funny you might say. It was what happened to me in Havana. In any case, I remember it well, and it gives me a good laugh. In August 2011, I traveled to Havana. Time was short, only two weeks. During this time I had to write almost 3/4 of the material. I lived in a house not far from the famous Copacabana Beach. But despite this short stay in Havana, I would be lying to say I could not go to the beach and breathe the sea air due to my “abnormal” work schedule. And as happens in these cases, the owners of the house were interested in who I was, what I was doing, if I had family, children, etc. - Yes, I have a family, children, etc. on average this seems to be the case. But they just couldn’t get it through their heads “How can it be that everyone goes to Cuba to relax, have fun, and this weirdo came to work? Oh well”. My days lasted 16 hours (or more). I dried up and my eyes turned white. For two weeks I got almost no sleep, I lost 5-6 kg (Without dieting, dear ladies!). I was pale as a white wall of Epe and probably looked more like a prisoner of war, not a person who was practically living on the beach in Havana. And the eternal question...any tour plans? As I mentioned before, the project Vitaly y Su Timba Habanera, is a studio project. My music is almost impossible to hear live. In any case, at this time there is no such plan. Let's see how this project develops later. Everything depends on you, dear listeners, supporters and lovers the timba style!